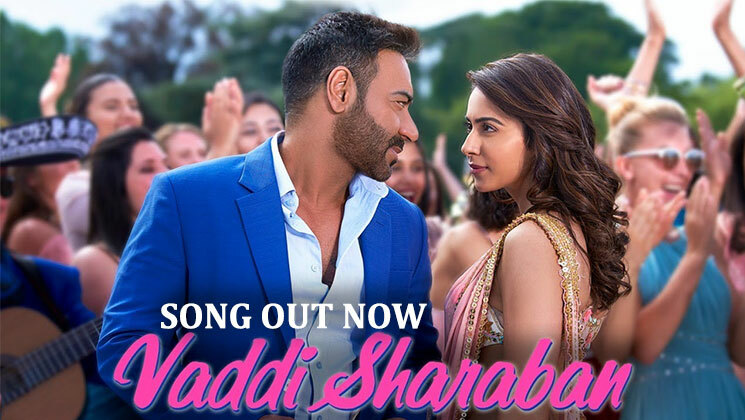 The makers of ‘De De Pyaar De’ have released the first song from the film, ‘Vaddi Sharaban’. Rakul Preet Singh‘s sizzling drunken dance moves are all set to woo Ajay Devgn at the party. The song seems to be fun on the outset with drinks flowing all over. Ajay Devgn and Rakul Preet Singh’s chemistry looks strikingly different from what we have seen the superstar do before. It’s fresh, and the couple will steal your hearts with their onscreen bonding. Talking of the film, it’s about Ajay’s character who is split between two beautiful women, Tabu and Rakul Preet Singh. ‘De De Pyaar De’ is the joyous rom-com for all ages. The trailer of the film was released on Ajay’s 50th birthday, which coincided with the character he was playing in the film of a 50-year old man. The trailer left people in splits with its humour. However, there were some brickbats that came Ajay’s way as well for working with #MeToo accused Alok Nath. Ajay defended himself by saying that the shooting of the film was long over before the allegations came in.